I woke at six. it was dark. It was Saturday. Somewhere in the back of my mind a synapse ran in wild happy circles playing a kazoo. I saluted the moment and drifted triumphantly back to sleep. Two hours later, my eyes were still closed. They say hearing is the first sense to operate as you drift back to consciousness. “What?” I enquired blearily. Clearly speech follows hearing fairly quickly when one emerges from sleep. With all speed I opted to employ my sense of sight. It was. It was snowing. at about 7:45 on a Saturday morning in October. It was snowing with big white flakes and it was laying on the sheds in the gardens and the leaves in the forest outside. When I was a girl you could go a year without seeing snow. In the seventies, alongside the drab brown wallpaper, those dire flare-dungarees and the dismal Biba prints, we had rain and mist, and the occasional sunny day during our winters. Dickensian white snowy days were pure, unadulterated legend. We have had a few gratifyingly severe winters, just outside London. Those ones where for a day or two you can’t get where you want to go. They have cancelled school, and we pottered about in wellies and we cooked warm stews. But October. That’s taking the neo-ice age a little too far, don’t you think? The kitten does not think so. Clive Bond sat on the sofa by the big window in out room and eyes the huge snowflakes with intent. I’m having one of those, he radiated, though he has not as yet launched himself at the window to claim one. But his small head would start as one came into view high above him, and he tracked it with no small measure of obsession down to the patio . If I were the snowflake I would feel hunted. Clive can’t go out, but the dog can. It is rather early to be considering the matter of his parka. But he needs something. The change in temperature has been so sudden. The range of jumpers for sale is bewildering. Chunky arrans, sporty track-suit tops, silky cashmeres: and I find that here is a huge range of knitting patterns for our best friends. Macaulay could be rolling happily in designer knits out there in the forest, knitted by my own fair hands. Except that I can’t knit. I share this attribute with a lady who owns two hens. They are hens called, wildly, Sage and Onion. They live in Gloucester with their new owner, Sue Christy. And they arrived with her in a sorry, sorry state. For they are ex-battery hens. They have lived a rather awful existence. Kept in pens about three quarter of the size of an A4 sheet of paper, they are given an artificial sunrise and sunset. Their beaks are cut to stop them worrying each other. They have fortified foods and, if kept for a year, would yield 338 eggs on average. But after 72 weeks they are deemed useless and- if no-one steps in- slaughtered. But people step in, and take them and rehome them. Poor Sage and Onion. They were stressed: and they had lost a huge amount of feathers. Ms Christy did try knitting jumpers. Honest. “I did try making the jumpers but it was a complete disaster,” said the Gloucester resident to the London freesheet, The Metro. So it seems we can meet out new ice age confident in the knowledge that there is a one-stop-cuddly-jumper-shop in town. One that even supplies jumpers for chickens. Now to kit out the Shrewsday clan. Posted in Shrewsday Mansions, UncategorizedTagged animals, battery hens, cats, cuddly jumpers, dogs, october, snowBookmark the permalink. Pseu, thank you so much, for this and the typos which I have accordingly deleted. Cross-eyed this morning: I have never been readier for half term 🙂 Does Techie have one? I was well away in the land of nod at 7.45am Kate, so can’t confirm or not if it was snowing up here in Cheshireland, but it was the right kind of cold for snow yesterday so it may have done overnight! No evidence of it now, though… brilliant sunshine. Those chickens look cute in their jumpers, but don’t introduce Clive Bond to them, for his sake! Cuddly Jumpers, Oh My! Snow in October, YIKES! Be not alarmed as I am just practicing my new role as neighborhood Headline Writer for local wacko newspapers. SC Taxpayers Hacked!! oops, guess that’s a real one, we’ll be among 3.6 million others hanging on the phone for days to remedy this. YIKES!! Only in Britain! Love it. Only you, Kate, would take us from the first startling snowflakes in October to chicken jumpers on Ebay! We’ve toyed with the idea of chickens here, but then we’ve toyed with many ideas. Maybe with those little jumpers it would work for us.Good for Sue Cristy and her ilk for rescuing these poor creatures. Enjoy the flakes. They won’t last long. I need to get the leaves raked up before it snows. Sigh. I did not see my first snow until the age of 20. Love the chicken jumpers, now I have seen everything and Happy Snow Days! It’s snowing here too..15cm they say and -17…I need one of those jumpers I think…aren’t they too cute!! Dear Kate, with regard to the October snow, I well remember about twenty years ago a snowfall/blizzard that dumped 32 inches of snow in Stillwater, Minnesota, on Halloween and the two days afterward. Second, with regard to cuddlies, I knew that pet stores here in the States had them for dogs and cats….. but chickens. Ah, now that’s a new piece of information that makes me aware of just how compassionate people who live with animals are. I keep the house rather cool during the winter (saving on the bill) and so I’m wondering if the three cats with whom I live would like cuddlies. I guess I have to explore this and interview them! Peace. Cuddlies and chickens. Bless you, Kate, for telling us about the folks who rescued them and cared enough for them to keep them warm. When I lived in Liverpool and Syracuse (both in Central New York), we sometimes had snow as early as October and once as late as on Mother’s Day in May (1998, I think). Syracuse’s snowiest year – when I lived there – was 1992-1993 when it had 192.1-inches of snow. That’s a lot of shoveling. Kate, I’m so glad I didn’t read this until now. I stopped by my friend Alison’s earlier today to drop off a table and chairs I borrowed, and she had her dog decked out in a rain smock. She hatedhatedhated the thing. I could tell. Jersey cows. I have heard of. (I really think they should move Cowes to Jersey – where it is doesn’t seem Wight.) Jersey hens are something hentirely different. All those connected with battery hens should be subjected to battery, don’t you think? Mallet or tazer or both. I LOVE THIS. 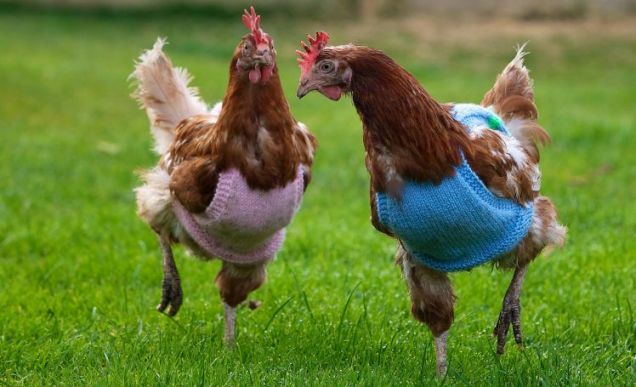 The chickens are so cute in their little jumpers. And I’m glad to hear those poor factory chickens go to good homes. As for Clive Bond: I can imagine those eyes focused narrowly on the targeted flakes. But in a most debonair fashion, I’m sure. We have an online chook store in Australia that sells chicken nappies – haha – for those who treat their chickens as pets and let them come inside. Caged chickens are the saddest of creatures – it would be great if everyone would eat free-range eggs or no eggs at all (or best of all – have a couple of chickens in the backyard and have your own eggs). The big problem is when you go out to eat and you don’t know where the eggs come from. It would be the best if caged chickens were banned altogether. So the kazoo sounding whale made it into your slumber, Kate? Glad that Sage and Onion have a HAPPY home now. Chicken jumpers. On Ebay. Kate, you’ve broadened my horizons yet again. I know better than to think I’ve seen everything … but … chicken jumpers? Who’da thunk it? Toilet Zen: Henry VIII and lavatory reading.